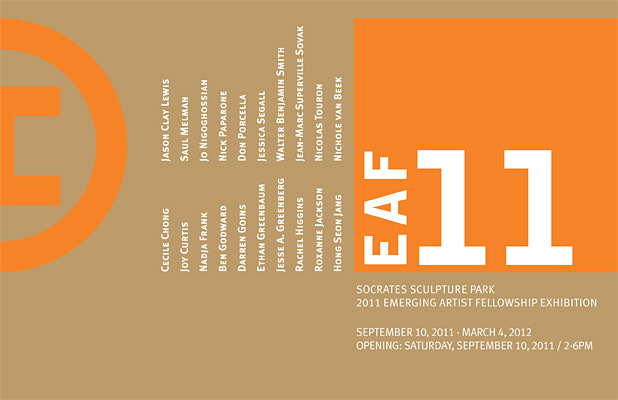 Socrates Sculpture Park is pleased to announce the recipients of the EAF11: 2011 Emerging Artist Fellowships. To mark the 25th anniversary of Socrates Sculpture Park, we are highlighting Socrates’ founding commitment to supporting artists at an early and seminal stages in their careers by completing a phased expansion of the EAF program to reach twenty fellowships as an annual number. Since its inception, the EAF Program has supported 170 artists. This year, fellowships have been awarded to: Cecile Chong, Joy Curtis, Nadja Frank, Ben Godward, Darren Goins, Ethan Greenbaum, Jesse Greenberg, Rachel Higgins, Roxanne Jackson, Hong Seon Jang, Jason Clay Lewis, Saul Melman, Jo Nigoghossian, Nick Paprone, Don Procella, Jessica Segall, Walter Benjamin Smith, Jean-Marc Superville Sovak, Nicolas Touran, and Nicole Van Beek. Fellowship artists are awarded a grant and a residency in the Park’s outdoor studio and are also provided with technical support and access to tools, materials, and equipment to facilitate the production of new sculptures for exhibition in the Park. The artists develop their projects throughout the summer in the open studio and on site in the landscape, offering visitors the opportunity to experience the creation of the works that are then installed in the Park. Representing a broad range of materials, working methods and subject matter, the diverse sculptural works in this exhibition are presented against the spectacular waterfront view of the Manhattan skyline. Emerging Artist Fellows are selected annually through an open application process and reviewed by a committee comprised of past EAF recipients; established artists who have shown a commitment to mentoring and advocating for younger artists; as well as writers, gallerists, and curators who have special knowledge of contemporary art. The 2011 Advisory Committee members were: Erin Donnelly, Special Projects Consultant for the Lower Manhattan Cultural Council and Exhibition Coordinator and Curator for Volunteer Lawyers for the Arts (VLA) Art & Law Residency Program; David Brooks, 2009 EAF recipient; Dan Byers, Associate Curator of Contemporary Art at the Carnegie Museum of Art; Scott Zieher, published poet and co-owner and director of ZieherSmith gallery. This exhibition is made possible by the dedication and support of our volunteers and friends and by the generosity of: Milton and Sally Avery Arts Foundation • Bloomberg Philanthropies; Lily Auchincloss Foundation; Charina Endowment Fund; The Dedalus Foundation; Mark di Suvero; Foundation for Contemporary Arts; Maxine and Stuart Frankel Foundation; Agnes Gund; Jerome Foundation; The Peter T. Joseph Foundation; Gabrielle H. Reem M.D. and Herbert J. Kayden M.D. ; Lambent Foundation Fund of Tides Foundation; Ivana Mestrovic; The New York Community Trust; Brooke Kamin Rapaport and Richard A. Rapaport; Louise and Leonard Riggio; Silvercup Studios; Mr. and Mrs. Thomas W. Smith. This program is supported in part by an award from the National Endowment for the Arts. This exhibition is supported, in part, by public funds from the New York State Council on the Arts, a state agency, and by public funds from the City of New York Department of Cultural Affairs in partnership with the City Council. Special thanks to the City of New York, Mayor Michael R. Bloomberg, Queens Borough President Helen M. Marshall, City Council Speaker Christine C. Quinn, Assemblywoman Catherine Nolan, City Councilmembers Jimmy Van Bramer and Peter F. Vallone Jr., and the Department of Parks & Recreation, Commissioner Adrian Benepe. 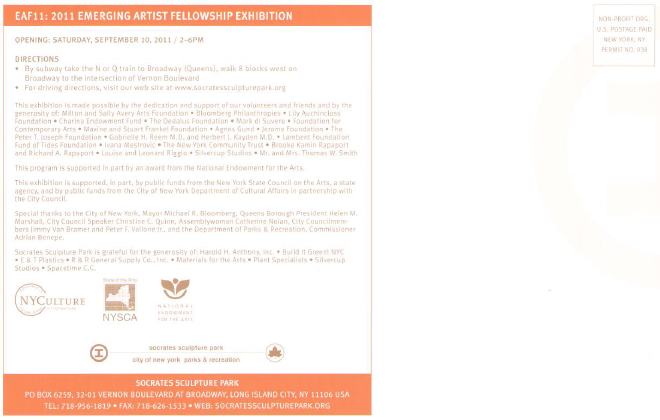 Socrates Sculpture Park is grateful for the generosity of: Harold H. Anthony, Inc.; Build It Green! NYC; E & T Plastics; R & R General Supply Co., Inc.; Materials for the Arts; Plant Specialists; Silvercup Studios; Spacetime C.C.